A number of leading progressive US politicians advocate using the Federal Reserve's balance sheet to fund expansive new government programs. Although their arguments have a grain of truth, they also rest on some fundamental misconceptions, and could have unpredictable and potentially serious consequences. 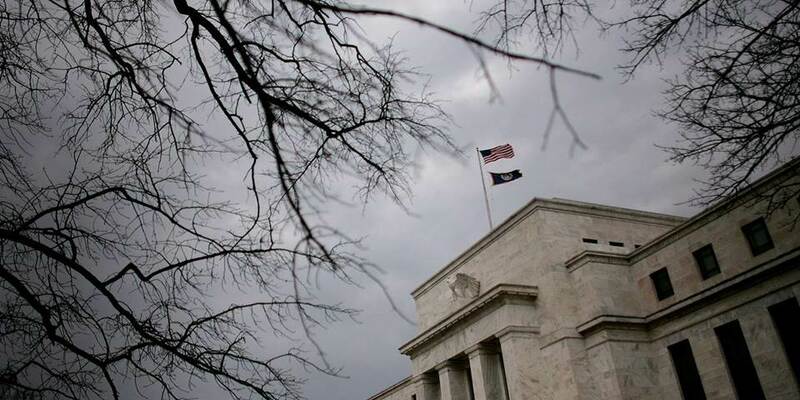 CAMBRIDGE – Just as the US Federal Reserve seems to have beaten back blistering tweets from President Donald Trump, the next battle for central-bank independence is already unfolding. And this one could potentially destabilize the entire global financial system. A number of leading US progressives, who may well be in power after the 2020 elections, advocate using the Fed’s balance sheet as a cash cow to fund expansive new social programs, especially in view of current low inflation and interest rates. Prominent supporters of this idea, which is often referred to as “Modern Monetary Theory” (or MMT), include one of the Democratic Party’s brightest new stars, congresswoman Alexandria Ocasio-Cortez. Although their arguments have a grain of truth, they also rest on some fundamental misconceptions. Fed Chair Jerome Powell could barely contain himself when asked to comment on this new progressive dogma. “The idea that deficits don’t matter for countries that can borrow in their own currency I think is just wrong,” Powell insisted in US Senate testimony last month. He added that US debt is already very high relative to GDP and, worse still, is rising significantly faster than it should. Powell is absolutely right about the deficit idea, which is just nuts. The US is lucky that it can issue debt in dollars, but the printing press is not a panacea. If investors become more reluctant to hold a country’s debt, they probably will not be too thrilled about holding its currency, either. If that country tries to dump a lot of it on the market, inflation will result. Even moving to a centrally planned economy (perhaps the goal for some MMT supporters) would not solve this problem. On Powell’s second point, that US debt is already high and rising too fast, there is far more room for debate. True, debt cannot rise faster than GDP forever, but it may do so for quite a while. Today’s long-term, inflation-adjusted interest rates in the US are about half their 2010 level, far below what markets were predicting back then, and far below Fed and International Monetary Fund forecasts. At the same time, inflation has also been lower for longer than virtually any economic model would have predicted, given current robust US growth and very low unemployment. What’s more, despite being at the epicenter of the global financial crisis, the US dollar has become increasingly dominant in global trade and finance. For the moment, the world is quite content to absorb more dollar debt at remarkably low interest rates. How to exploit this increased US borrowing capacity is ultimately a political decisión. That said, it would be folly to assume that current favorable conditions will last forever, or to ignore the real risks faced by countries with high and rising debt. These include potentially more difficult risk-return tradeoffs in using fiscal policy to fight a financial crisis, respond to a large-scale natural disaster or pandemic, or mobilize for a physical conflict or cyberwar. As a great deal of empirical evidence has shown, nothing weighs on a country’s long-term trend growth like being financially hamstrung in a crisis. True, policymakers could again resort to financial repression, and force citizens to hold government debt at below-market interest rates, as an alternative way of reducing the debt burden. But this is a better option for Japan, where most debt is held domestically, than for the US, which depends heavily on foreign buyers. Having the Fed issue short-term liabilities in order to buy long-term government debt turns policy 180 degrees in the wrong direction, because it shortens the maturity of US government debt that is held privately or by foreign governments. Contrary to widespread opinion, the US central bank is not an independent financial entity: the government owns it lock, stock, and barrel. Unfortunately, the Fed itself is responsible for a good deal of the confusion surrounding the use of its balance sheet. In the years following the 2008 financial crisis, the Fed engaged in massive “quantitative easing” (QE), whereby it bought up very long-term government debt in exchange for bank reserves, and tried to convince the American public that this magically stimulated the economy. QE, when it consists simply of buying government bonds, is smoke and mirrors. The Fed’s parent company, the US Treasury Department, could have accomplished much the same thing by issuing one-week debt, and the Fed would not have needed to intervene. Perhaps all the nonsense about MMT will fade. But that’s what people said about extreme versions of supply-side economics during Ronald Reagan’s 1980 US presidential campaign. Misguided ideas may yet drag the issue of US central-bank independence to center stage, with unpredictable and potentially serious consequences. For those bored with the steady employment growth and low inflation of the past decade, things could soon become more exciting. Can monetary regime prevent US from morphing into eurozone or Japan in next recession? The US Federal Reserve has announced that it will conduct a root and branch review of its monetary policy framework in the next 18 months. The results could be of first order importance for financial markets, especially the bond market. Richard Clarida, the Fed’s vice-chairman said last month that the motivation was not any great dissatisfaction with the present policy. Both of the twin objectives — maximum employment and stable prices — were close to target. Instead, the Federal Open Market Committee seems concerned that inflation is failing to respond to recovering economic activity, implying that it might be difficult to cope with even lower inflation when the economy next enters a recession. The fact that US inflation has not responded to sharply falling unemployment levels, sometimes known as the disappearance of the Phillips Curve, is often described as a puzzle. However, that word is misleading, since a great deal of recent research has established the main reasons for the loosening of this relationship. Structural factors such as the effects of the internet and Chinese imports on goods prices have been important. But a key conclusion is that the growing credibility of the Fed’s 2 per cent inflation target has anchored inflation expectations, so that any temporary fluctuations in inflation and economic activity are ignored. In the decades before 1990, inflation shocks were often “accommodated” by monetary policy, altering expectations, and causing substantial spikes in inflation. This change in the inflation mechanism is a good thing, but it means that the FOMC cannot rely on easily controlling inflation by adjusting economic activity and unemployment, via interest rate policy. In an extreme case where inflation does not respond at all to unemployment, inflation becomes indeterminate, spelling the end of monetary policy as we know it. The Fed does not believe that the US has reached this extreme state. The most influential members of the FOMC believe the Phillips Curve is “alive and well”. But they think that the flattening in the curve emphasises the importance of keeping inflation expectations anchored to the 2 per cent target, whether inflation shocks are upwards or downwards. At present, there is no sign of any upward shift in inflation expectations but the FOMC is concerned that expectations may drop well below the 2 per cent target during the next recession. This is because the effective lower bound on nominal interest rates is fairly close to zero, while the equilibrium level of interest rates (r*) is also lower than before. Because of this combination, it may be hard to offset a large deflationary shock by lowering interest rates far enough below equilibrium. Eventually that might lead to a permanent drop in inflation expectations, as has occurred in Japan and more recently the eurozone (see box). The main focus of the Fed’s review can therefore be loosely summarised as follows: how can the monetary regime prevent the US from morphing into the eurozone or Japan during the next recession? One idea for avoiding the Japanese deflationary trap is simply to raise the existing inflation target from 2 per cent to 3-4 per cent, but Mr Clarida has specifically ruled this out. The current mechanism always aims for 2 per cent inflation in the period immediately ahead, and does not compensate for any shortfalls in the past. This leads to a downwards bias in the actual path for inflation over long periods. Instead, the central bank could target the average inflation rate at 2 per cent in the long term. When prices fall below the long-run 2 per cent target during a recession, the Fed would credibly commit to compensating for this error during the subsequent recovery. Forward guidance would be reinforced, and policy would be kept easier for longer, until prices got back on to the 2 per cent track. This would mean that the short run inflation rate may exceed 2 per cent while the catch-up to the long-term path occurs. The FOMC is already moving in this direction with recent policy decisions. The main question is how they should formalise the new regime, such that it survives the difficult political tests when inflation temporarily rises to more than 2 per cent during the catch-up periods. Former Fed chairman Ben Bernanke has made influential suggestions about this but the details are open for debate. There will also be discussion about new policy instruments to make the effectiveness of the new regime credible, especially at times when interest rates are at the effective lower bound, and quantitative easing is fully utilised. The leading idea appears to the imposition of Japanese-style bond-yield ceilings, enforced by unlimited central bank buying of bonds. Remarkably, that would take the Fed back to its pre-1951 regime, under which it committed to support the war effort by buying enough Treasury securities to keep long bond yields under 2.5 per cent, whatever the stance of fiscal policy. That nuclear option will not be used outside a big economic emergency, but it is interesting that it is even mentioned as the review gets under way. What would be the market consequences of long-term “average” inflation targeting? - The tail risk of endemic deflation would decline, and long-term inflation expectations might be slightly higher than before. This would help risk assets. - The volatility of inflation and bond yields would decline still further. - The average level of nominal bond yields might be little changed, but inflation break-evens would rise while real yields decline, reflecting the longer periods of easier monetary policy that would be needed to allow the phases of inflation catch-up to occur. The bigger the next deflationary shock, the greater these effects would be. Inflation volatility in the US has plummeted, with core inflation settling close to the 2 per cent target.In the eurozone, inflation has become stuck at 1 per cent, well below target.In Japan, the situation is even worse, with inflation fixed permanently at zero. In the eurozone, inflation has become stuck at 1 per cent, well below target. In Japan, the situation is even worse, with inflation fixed permanently at zero. It was only a matter of time before Apple issued a credit card. The world’s first company to reach a $1tn market value has more cash on hand and more global reach than most banks, so why shouldn’t it act like one? The move, which is in partnership with Goldman Sachs, is something that many of its shareholders have long advocated. Carl Icahn, who dumped the stock a few years ago over concerns about the company’s China sales, told me Apple should be a bank way back in 2013. But it is also an example of a market trend known as financialisation. That is a wonky term used mostly by academics to describe the rise of finance and financially-oriented behaviour throughout our economy. This catch-all covers everything from criticisms that companies are prioritising value for shareholders, to claims that some executives are manipulating balance sheets to boost their short-term results. It also takes in companies that focus more on finance than their core businesses and those that load up on corporate debt. The trend is ubiquitous. Apple is not alone in trying to act like a bank: academic research shows that the share of revenues coming from financial relative to non-financial activities in US corporations began to climb in the 1970s and then increased sharply from the 1980s onwards. This mirrors the rise of finance in the economy itself. Such financialisation has been a key driving force in the global economy for several decades. But I now believe we have reached what I call “peak Wall Street”, the apex of that trend, and there will be diminishing returns for companies that choose to focus more on markets than the real economy. The evidence is all around us. Consider the decline of Kraft Heinz. The company demonstrates how a strategy focused on short-term financial results can backfire. The packaged foods group is partly owned and run by Brazilian private equity group 3G, which made its name through extreme cost-cutting and zero-based budgeting that focused on profit margins rather than growing sales. The private equity group has been accused of eschewing longer-term investment while employing short-term financial tricks such as paying suppliers late in order to improve free cash flow. Kraft Heinz has lost more than half its equity value since its creation in a 2015 merger. Then there is the US shale industry. Activist investors — or barbarians at the gate to their critics — have been swarming, looking for companies with bloated budgets that need trimming. There are plenty of targets, thanks to an overexpansion funded by investors seeking higher yields. The energy bond market has tripled in size in the past decade, but much of the money has funded higher executive salaries and an output glut. Debt-laden companies are now ripe for forced consolidation by private equity and other investors. The multiyear explosion in share buybacks, which increase earnings per share by reducing the number of shares, reflects the trend. Warren Buffett may argue that buybacks are a welcome use of spare cash. But I think they are best done at the start of a credit cycle, rather than at the end, which is where we appear to be now. Most companies are buying back shares not as a vote of self-confidence in their own future, but as a way to boost their share prices — a classic financialised move. The US Federal Reserve’s surprise decision in January to pause interest rate increases may keep buybacks coming for a bit longer. That is because lower rates make it cheaper to borrow money to pay for all those shares. But the fact that the Fed was forced into a U-turn by choppy markets is another sign of too much financialisation. Easy money has become a morphine drip that too many companies and investors can’t seem to do without, even though we are nearly 10 years into an economic recovery. In fact, low interest rates have papered over myriad political and economic problems not just for 10 years but for several decades. Total financial assets are now more than triple the size of the real economy. The corporate bond market is now worth $13tn — twice as much as in 2008. Debt is, of course, the lifeblood of finance. But it is also the biggest indicator of future crises. The OECD, the Paris-based club of mostly rich nations, last week warned about the record amount of debt in the corporate bond market in its historically low ratings. More than half of investment grade bonds issued in 2018 were of the lowest possible quality. This may amplify the effects of an economic slowdown that many feel is imminent. “The amount of corporate bond investments that may be expected to default in the case of an economic downturn may be considerably larger than that experienced in the financial crisis,” the OECD said. Already heavily indebted sectors such as energy are experiencing higher levels of default. Financialisation has risen for nearly five decades now. But like much else in the markets today, it seems ripe for a correction. Philippine President Rodrigo Duterte has appointed a central banker from the cabinet. Investors may rue the decision one day. Central bank independence is under threat as politicians around the world meddle more in monetary policy. Investors, so far, haven’t seemed to care too much. By the time they miss it, it may be too late. Philippine President Rodrigo Duterte—no stranger to controversy—on Tuesday handed control of the Asian country’s central bank to a political ally, Benjamin Diokno. Mr. Diokno is a professional economist and technocrat. But he’s also the first person to go directly from the Philippine cabinet to helming the central bank since it became independent in 1993, having previously been Mr. Duterte’s budget supremo. In that role, he advocated for a larger budget deficit, so it’s little wonder Mr. Duterte would back him for the job. Central bankers who are likely to keep interest rates low to facilitate borrowing are music to the ears of populist leaders who want to keep on spending. Still, if the appointment poses a threat to economic stability in the Philippines, markets seem little bothered. The dollar rose marginally against the Philippine peso on Tuesday, gaining 0.7% to 52.2. The country’s benchmark equity index, the PSEi, fell 0.1%. Likewise, investors cared little when India’s former central bank head resigned late last year after months of tension with the government, to be replaced by someone more to Prime Minister Narendra Modi’s taste. Closer to home, the market has largely shrugged off President Donald Trump’s public disagreements with Federal Reserve Chairman Jerome Powell. In recent years, some markets even rallied when a political leader appointed a like-minded ally to run the central bank. Japan’s benchmark Nikkei Stock Average surged about 80% during Japanese Prime Minister Shinzo Abe’s two-year first term, during which he elevated Haruhiko Kuroda to head of the Bank of Japan . Investors should care more about this erosion of central bank autonomy even so. For sure, when a major economy like Japan is struggling to escape deflation, investors rightly care more about returning it to strength than the country’s institutional integrity. The Philippines, which clocked an inflation rate of as high as 6.7% in 2018, doesn’t have that problem though. 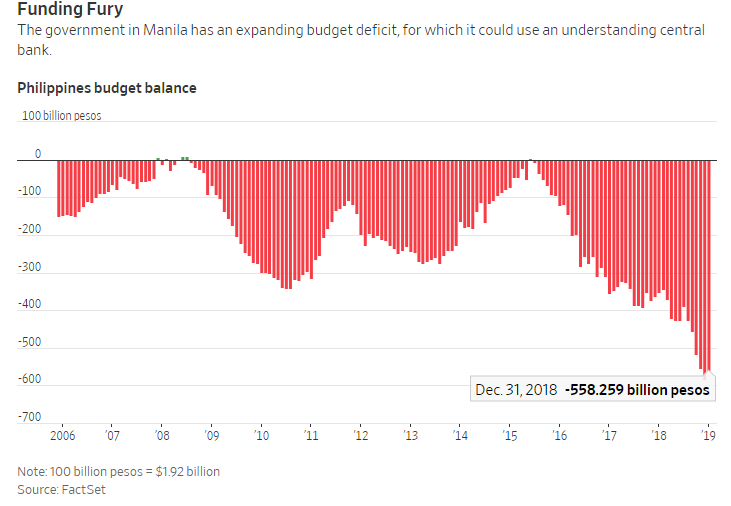 A more relevant warning for Manila comes from Turkey, where a politically compromised central bank’s lack of action against raging inflation and a tumbling currency left the MSCI Turkey index down 45% in dollar terms last year. When an economy comes under pressure, investors need a monetary authority they can trust to do the right thing, regardless of political pressure. In those circumstances, knowing that a central bank will take necessary and painful measures to stem capital outflows and protect the value of a currency matters a great deal. Investors may not feel able to price in a future monetary emergency today. They should still worry about what this latest chipping away of central banks’ independence means for the future.